Our Core Values lead us to continually raise the standard of excellence in the quality, reliability and affordability of our products and services. In the business of construction, trust is integral. Our word is our bond, and we promise to deliver according to your specifications and schedule. We believe in achieving dreams, but not at the expense of our planet. Our eco-friendly practices show that we care. We think in terms of tenths of millimetres so that you can focus on the bigger picture. Our standards matter as much to us as they do to you. We keep striving to create and innovate, and we’ll never stop. As the saying goes, "In the race for excellence, there is no finish line." We want our values and best practices to set the standard for this industry in the GCC region and beyond. Healthy competition drives us and our competitors to keep on improving, which leads to exponential growth. We share our knowledge and expertise to empower the next generation and make the world a better place to live in. We aim to be an invaluable asset to our customers with our commitment to provide only the best in terms of service and products. 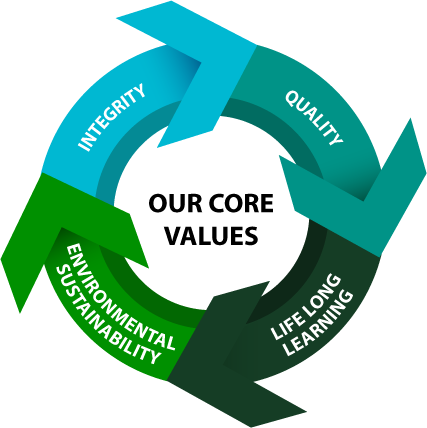 Our vision is to make the world a better place, one rubber extrusion at a time. Because it’s the small things that make up the biggest dreams.